The DS1206N is a BASIC-programmable board designed primarily forserial-over-IP and serial control applications. Being small enough tofit inside your product, the board offers a rapid developmentalternative to using modules, which require designing a new host PCB. Like the DS1206controller, the DS1206N features a multi-channel serial port. Thedevice has a single serial port connector and is priced as asingle-port device, yet packs four independent serial channels. Have nouse for those DSR and DTR lines? Turn them into RX and TX of anadditional serial channel. Don't want CTS and RTS either? That's onemore channel! In total, there are 15 different configurations to choosefrom. 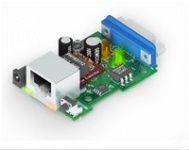 The board is supplied in three versions offering various serial portand power options. It comes preloaded with a fully functionalserial-over-IP application. Three options: DS1206N-RS, DS1206N-TM, and DS1206N-TS. Superior upgrade to the EM1202EV board. DS1206N-TM: optional "12V" power input from the serial port. DS1206N-TS: direct 3.3V input (must be regulated to +/- 5%).